There are some 25 000 strokes per year in Finland, in population of 5 million. Prevention is the only way to reduce this number. Medical community claims that 8 out 10 strokes can be prevented, if all there is to be done, gets done. Risk factors leading to stroke are several, but we knew it is not good idea to try address them all, message gets blurred. We spoke with Liisa Koivula, Communications Coordinator from Aivoliitto, the Finnish stroke support organisation. – Estimated 2 million of Finns have elevated or high blood pressure. 7 out 10 stroke patients (infarction patients) admitted to hospital have problems with their BP: It´s either not treated or medication they have is not optimal nor working as it should. -says Liisa. – So, we decided to start with raising awareness of blood pressure. Our impression was, first, that people don’t really know that there is a connection between brain health and blood pressure. We had a query done, and it was true; people knew high PB is not good for you, your heart suffers somehow, but the fact that elevated blood pressure can cause a stroke, was far worse known than implications for your heart. But; it did not really matter if you knew or not, people we asked did not think it was too important to measure one´s blood pressure, not at least if you had no symptoms. – Then we decided we want things to happen. We wanted people to understand that by taking care of your blood pressure you protect your brain. And that it is a good idea to measure your blood pressure at home or get it measured by someone in healthcare. We wanted to tell that blood pressure is a top priority and that became our slogan on brochures (in three languages, Finish, English and Swedish). – We have only a limited range on materials, actually just the brochure (to be given away) and two different posters, so that you can advertise your pop-up measurement point for example on shopping centers’ doors. – We asked our local associations, pharmacies, companies etc to put up a BP measurement points during one week in October. They could to do measurements for a few hours, whole day or several days. Our only requirement was, that person or persons working on the point were healthcare professionals. We delivered the material, they did the job. During this action week we have had map of the points on our campaign webpage, so one could see, when and where she or he could get your BP checked. This one measurement was like just a way encourage people to go with measuring at home, the brochure they were given, had instructions how to do it. -First year we had about 80 pop up points, next year over 100 and last year (2017) about 240. – At the same time on October we were present on radio, social media, YouTube and tried to catch media´s attention – that was hard, although last year we got on to national TV, that was a jackpot. We believe social media has been important for us, and it has kept us going between Octobers – we have also found that advertising in radio worked well for us, so for example in spring of 2017 we collaborated with local radio and made a series on brain health with them. 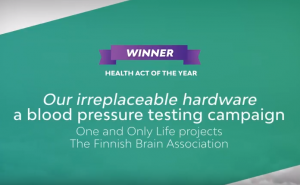 Finnish Brain Association’s blood pressure campaign “The Priceless Processor” was awarded with the Health Act of the Year 2018 award by Tamro.